You don't have to spend a fortune to buy a really decent fan. In the 1980's and 1990's, Casablanca owned the fan business but their designer fans were often $500 and higher. However their fans stayed the same and have been outsold significantly by other brands and more specifically Minka Aire. 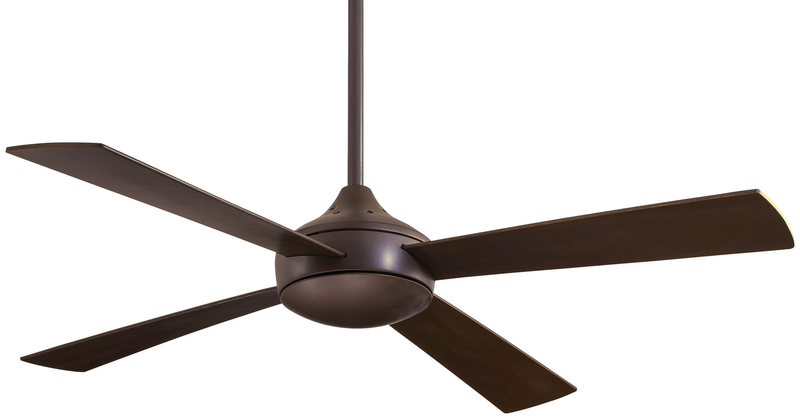 In my opinion, Minka Aire designs and produces the best fans in the industry. They are also affordable, so you don't have to compromise style for price. Aside from budget there are many other factors to consider. What style fits my home? What color fits with my furniture, flooring, and/or wall color? The height of the ceiling determines the configuration of the fan especially. 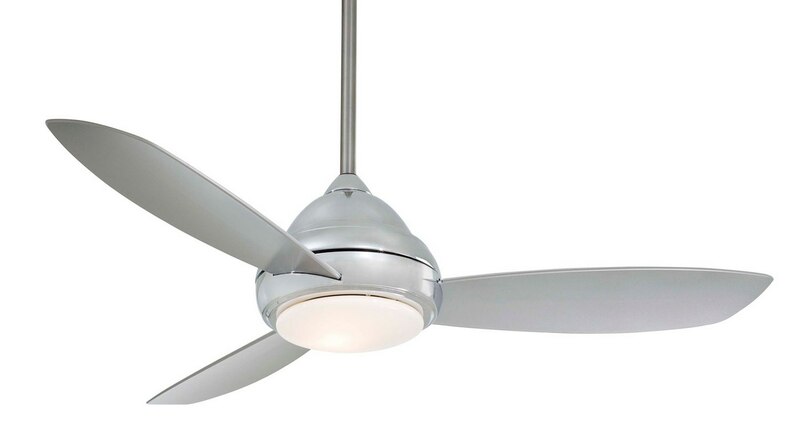 I'm showing these fans in other finishes than white, because white is the dominant color in fans due to the white ceilings. Bronzes, polished nickels and other finishes could be a nice accent to your decor. Lastly, most people equate size or number of blades with better airflow, but the angle or pitch of the blade is more important. You see two blade fans in restaurants that move a ton of air. Maximum drop is 11” and blade drop is 8”. Available in polished nickel, white, brushed nickel, and bronze. 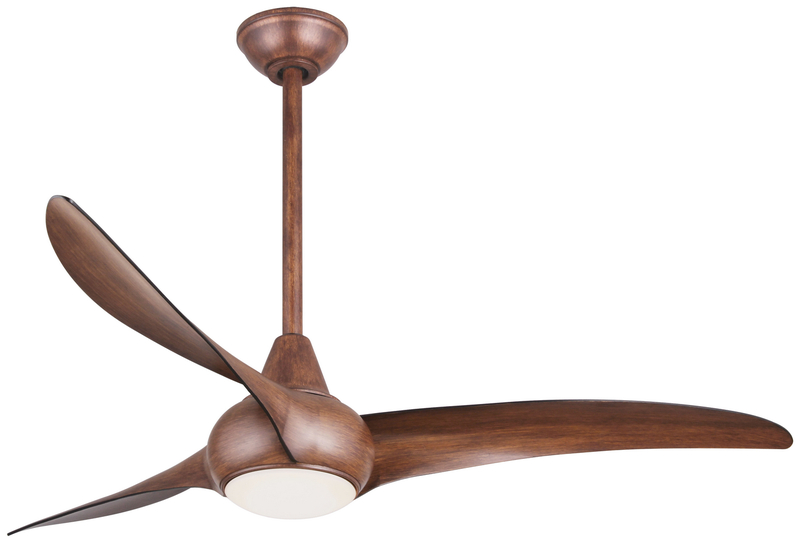 A good looking short or “ceiling hugger” fan is hard to find in the market. This fan is great for lower ceilings and smaller (8 foot by 10 foot) rooms. The model above is a slight variation from the first one. It is better for higher ceiling of 8 feet 2 inch and above. These fans are transitional style in looks and can fit a more contemporary style or industrial or rustic style in bronze. For a more traditional look see the Bolo below, also available in a number of finishes. Oil Rubbed Bronze, Distressed bronze and Belcaro walnut as shown above. It has 5,700 CFM but must be installed in an 8 foot 10 inch or higher ceiling since it has a drop of 20 inches. The fan above is called the Light Wave and is a sleek new energy saver. $279.95 price for above. It has a 7 watt LED light bulb that uses only 66 watts yearly. The Light Wave has a very large airflow of 6,570 CFM. Also, it features a remote for the speed of the fan and the dimming of the light. The blades are 52 inch in white & silver. Also available without the light for $209.95 below in the Wave model. Both have a 13 ½” inch drop and require a minimum of an 8 foot ceiling. This fan is 52 inch wide therefore is good for the 10’ by 12’ average bedroom. However even with a three inch pole you will have a drop of 15 ¾” and therefore need to have a 8 ‘3” high ceiling as a minimum. I like the contemporary feel. This requires a three wire system. Your electrician will need to insure there are two black and two white and one neutral to control the fan and the light. Also you can not reverse this fan from the controller and must switch manually from summer to winter mode. The fan above is the Delano Hugger and can go in a ceiling as low as 7’7”. I love this fan because it has a wall controller from which you can change direction for the winter vs summer mode. I like this fan (even though it's over $300), because it is elegant and can be used in short ceilings. It has a very good CFM at 5,634 and is reasonably priced in dark bronze as seen above, polished nickel with silver blades and pewter with natural walnut blades. It looks great in classic homes and is great for very low ceilings. As I said originally, you don't have to spend a ton of money to buy a really nice fan anymore. Just measure the ceilings and match your decor. Please consider a non-white fan! Get our free Kitchen Lighting Buying Guide with tips, trends and resources for planning your kitchen lighting. Over 150,000 people have found answers in a Yale guide.